Fancy winning a 200,000 coin jackpot on just one spin of the reels? 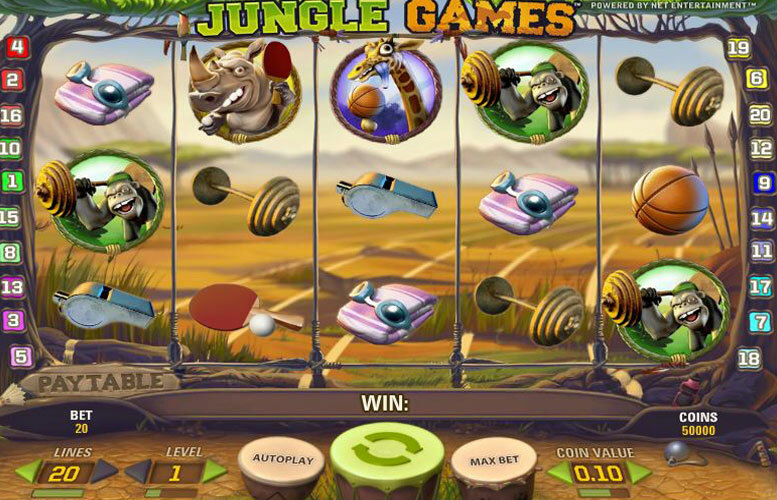 Well if you do then you definitely want to give the Jungle Games slot machine a go. Plus if you miss out on the top prize there’s still wilds all over the place to help you win more often and free spins to be won which always pay extremely well. 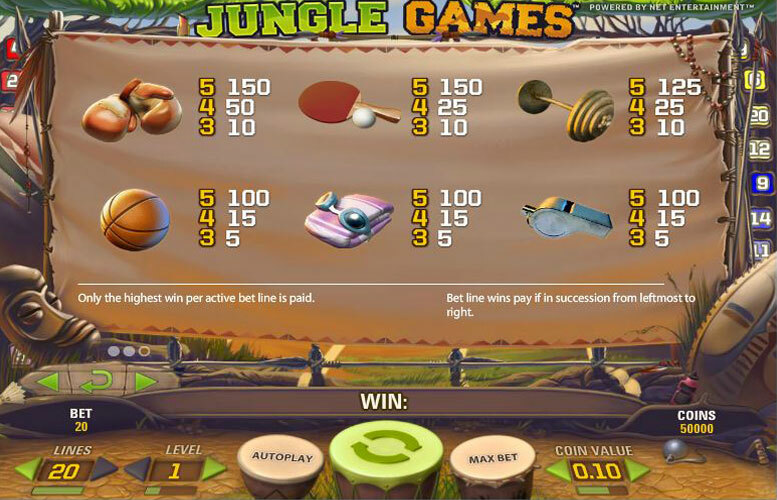 If you are ready for some jungle fever that is going to pay you for your efforts, then sit yourself down for a few spins at the Jungle Games slot machine. Now you may not find the graphics all that realistic or and they won’t give oyu the illusion that you are in the jungle, but when you hear those coins dropping then you arn’t going to mind one little bit. This is one virtual trip to Africa that can pay off for you. 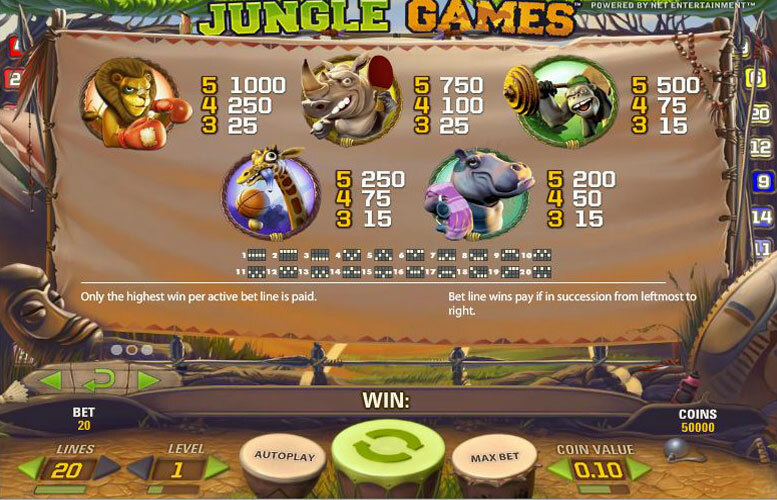 As you can guess it’s a jungle theme that is packed full of plenty of bonuses, and chances to win some decent payouts (top prize is 200,000 coins). It’s a 5 reel 20 line game with scatters, wild multiplier, and a free spin bonus along with a few extras, like a pick win bonus or a bonus prize in lieu of the free spin bonus, which is your choice. The top jackpot that you can walk away with here is 200,000 coins, and to convert that into cash winnings will depend on your level of bet with the lowest being 0.02 right up to 1.00. The winning combination to rake in this jackpot is lining up 5 gold cup trophies, which pay 10,000 on each winning line, across all 20 paylines. Betting begins at 0.02 per line up to 0.50 per line. You can wager up to 4 coins per line by adjusting the bet level which ranges from 1-4. Remember the more you wager and the number of lines you choose to bet on increases the monetary value you will realize on your winnings. 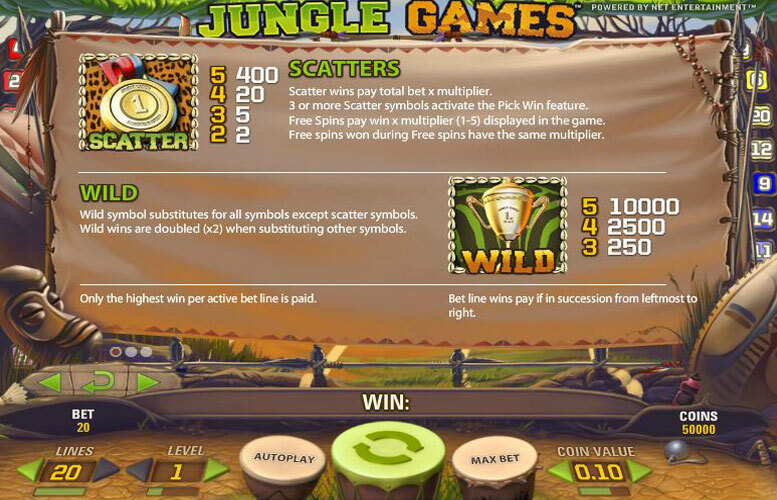 The extras that come with the Jungle Games slot are the wild multiplier symbols, which is the gold cup trophy. This means it increases your chances of a winning combination when it appears with other symbols, and can multiply the win in that round. It also pays you out the 10,000 for the collection of 5, 2,500 coins for landing 4 of them and 250 for getting 3. The scatters do not have to be aligned to constitute a payout, and in this game the scatter is the gold medal. If one of your spins brings you three of the gold medal scatters you get to play the pick win bonus game. Here you will get to choose between enjoying some free spins, or an unrevealed bonus prize which will be determined when you click on one of the gold medal scatters that appeared on your spin. To determine your number of free spins if that is your choice, you again will click on one of the scatters which will reveal the number of spins you have won and with what multiplier. The Lions will bring you with a collection of 5, 1000 coins, 4 of them will give you 250 whereas just one with give you 25 coins. The Rhinoceros is generous with 750 coins when you turn up 5 of them, 100 coins to be paid for 4 of them, and just 25 for a collection of 3. The Monkey is not quite so generous with a payout of 500 coins for 5, 75 for a 4 coin bet, and a mere 15 for your three coin wager. The Hippopotamus is the cheapest of them all when it comes to the animal kingdom found here, offering you 200 coins when you collect 5 of them on your spin, or 50 if only four of them turn up, and just 15 coins if 3 of them grace you with their presence on a spin. Boxing gloves or the Ping Pong Paddles, turning up in their own group of 5 will give you 150 coins, but If you only get 4 boxing gloves you will get 50 coins, however 4 ping pong paddles will only allot you 25 coins. Three of either one of these symbols will pay out 10 coins. Weight symbols will give you 125 coins for a spin of 5 in one spin, while a spin turning up four with give you 25, and just three will only give you 10 coins. The basketballs, swimming towels or whistles each pay out the same when collected in their respective group. With 5 of one type paying 100 coins, a collection of 4 of the same will pay 15, and 3 of the same kind will pay 5 coins. This game has a rating of 4 / 5 with 235 total reviews by the users.